Power Options of 85 to 260 Vac and 11 to 36 Vdc. Sensor Power Built-In where required. 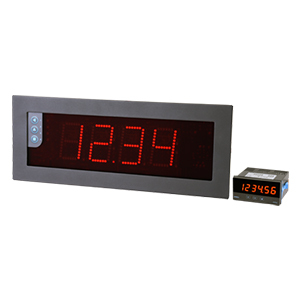 The LDB Series of large displays offer a wide range of measurement, alarm, and display capabilities for all types of industrial and commercial applications. Data can be seen at distances of up to 50 m (160') and by a large audience. These displays can provide control, alarms, and/or retransmission of measured data with field-installable options for relay or transistor outputs, SSR controls, analog retransmission signals, and communications in Modbus RTU, RS485 or RS232 ASCII protocols. All circuits are isolated for reliable performance and protection. The LDB series features a full NEMA 4 (IP65) metallic housing, designed to be panel mounted, wall mounted or suspended. The front keypad allows for easy configuration, and an optional remote keypad is also available. The front lens is made from anti-reflective tinted methacrylate, which provides a sharp and clear reading at long distances. Additionally, 5 levels of LED brightness allow for adjustments to suit most environments. Period up to 1000 sec. Nota: Comes complete with installation/user guide and 3-way brackets for panel, wall or suspension mounting.